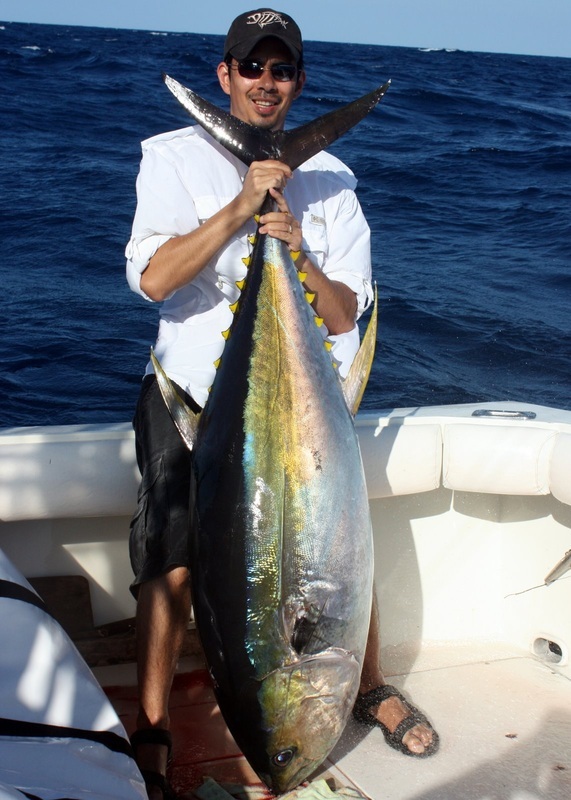 Yellowfin Tuna (“Ahi” in Hawaiian) are a beautiful and tasty fish found throughout the world in warm waters. They are probably the most commonly caught offshore gamefish. They often group together in enormous schools and can be seen breaking the surface chasing after bait. They often follow porpoise around and can be caught under schools of those. Tuna eat a large number of different things including baitfish like sardines and mackerel, squid, and even small pelagic crabs. They can become difficult to catch when they are keyed in on tiny baits. 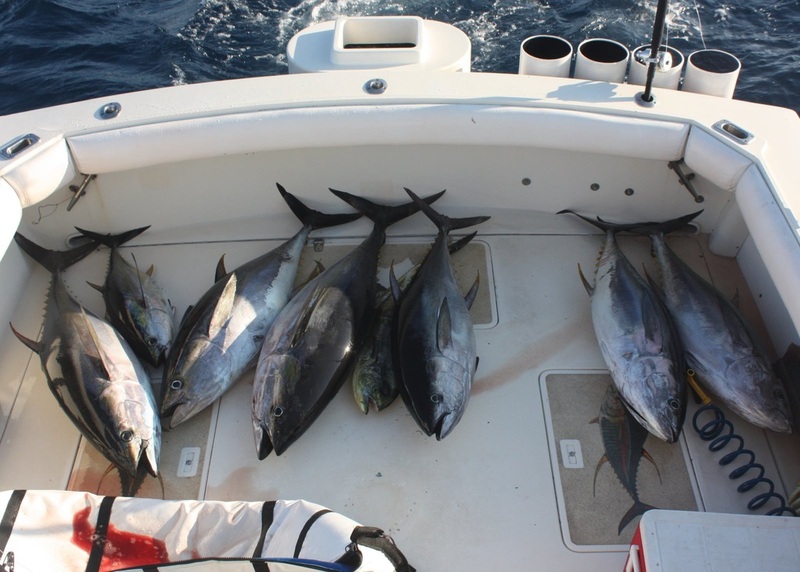 If you see tuna feeding on the surface and can't get them to bite, that could be the reason. Yellowfin Tuna swim great distances during their lifetimes. They attain sizes in excess of 400lbs, although fish this size are only found in the Eastern Pacific and are generally caught in Mexico. 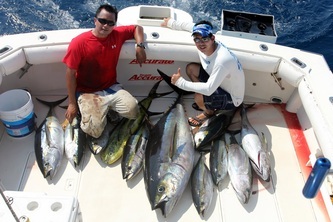 Many nice fish in excess of 200lbs are also caught in Panama. Like all tuna they pull hard for their size. They almost never jump when hooked, although I have seen them come out of the water to grab a bait or lure. When you get them near the boat they turn sideways and swim in large circles making it a long process to get them in the boat. It’s virtually impossible to horse the larger ones in quickly no matter what tackle you are using. They are a great gamefish and are great to eat. Yellowfin Tuna are very common in sushi restaurants. They are also good seared. I love to eat them fresh right on the boat with some soy sauce and wasabi. You should scale your tackle to the size of fish targeted. Small schoolies in the 10-15lb range are great fun on light tackle in the 15lb range, while the large ones require heavy gear and lots of 100lb braided line. They are almost never near any structure so if you have the patience you can land them on relatively light gear although that is a lot of work. For the big guys I recommend an Accurate Platinum ATD 50. Calstar rods are what I have used for almost every Tuna i have caught and I have used the Shimano Trinidad 16 reel for a wide variety of sizes. Yellowfin Tuna can be caught with bait and lures. Many techniques will work. 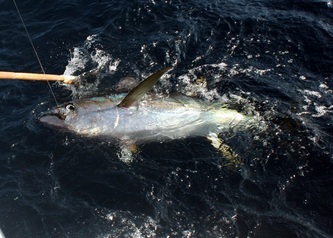 These tuna often feed near the surface so topwater techniques can be used. Once in a while they will hit topwaters when they won't hit anything else. 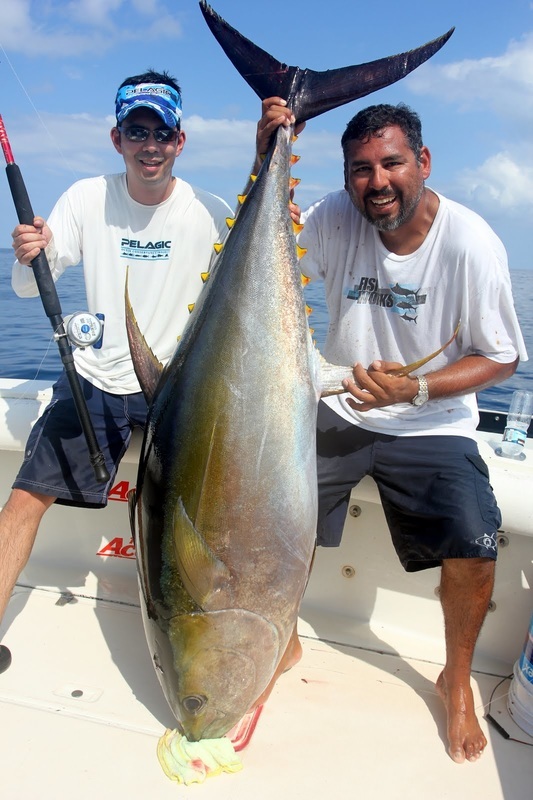 Like all tuna they have pretty good eyesight so you might want to try a fluorocarbon leader to reduce visibility. This also has the added bonus of abrasion resistance. Whether you are fishing with lures or bait, chum is often effective on tuna of all sorts, and Yellowfin are no exception. You can either chum with live bait or chunks of cut bait. That helps keep the fish around the boat. For trolling, you can try tuna feathers, cedar plugs, and plastic skirted trolling lures. Rapala type plugs also work. The Halco Max is a nice trolling plug because it can be trolled very fast. When in doubt on color blue and white is often good, as well as green. Personally I like to replace treble hooks with single or double hooks as they are less likely to bend or shake them. The cedar plugs don't look like much at all but they sure work. If you find a school of feeding fish you can cast lures into them. One fun way to catch them is with poppers. Both traditional chugger type lures retrieved in a “pop-pop-pause” rhythm. Ranger type lures skipped over the surface on a steady retrieve often work. Probably the best all-around popper for tuna is the Yo-Zuri Sashimi Bull. It can be skittered fast over the top or popped more slowly and the colors are amazing. In general I like a quicker retrieve with tuna since they have good eyesight, but I have seen them hit lures that were sitting still when really fired up. The Shimano Orca is a stickbait that has gained popularity recently. It is worked quickly near the surface. I don't think color matters too much but I like something with flash. Finally, metal jigs in metallic and blue colors often work well when the fish are deep. Anchovies and sardines work well for the smaller school size fish. 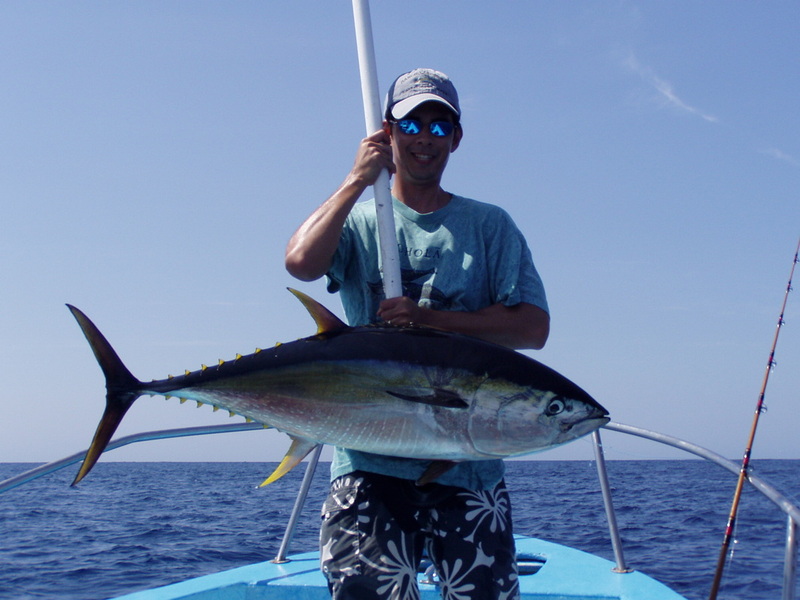 Pacific Mackerel work well for the larger ones, while the biggest ones can be targeted with large live Skipjack Tuna in the 2-5lb size. Many baitfish work; just try whatever is in the area that the tuna might be feeding on. They also eat squid if those are around. 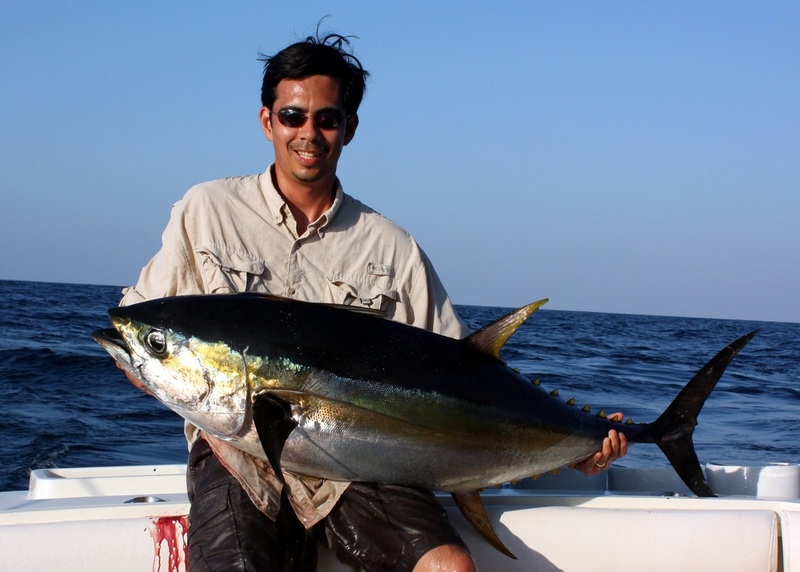 Very large Yellowfin Tuna can be caught fishing baits below a kite. The kite keeps the baits right at the surface. The baitfish splashing on the surface often works when nothing else will. I believe this works because the splashing attracts them and they can't see the line because it's out of the water. Goggle eyes work well for kite fishing; you rig a three-way swivel and fish two at once and that really gets the tuna going. If you are trying for giants you can try slow-trolling a live Skipjack. That also works well for Marlin if they are in the same area. 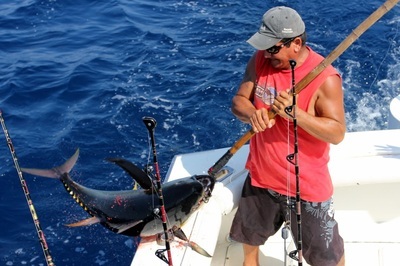 If you are going to try this make sure your boat has tuna tubes to keep the Skipjack alive. If live bait is not available you can try “chunking”. 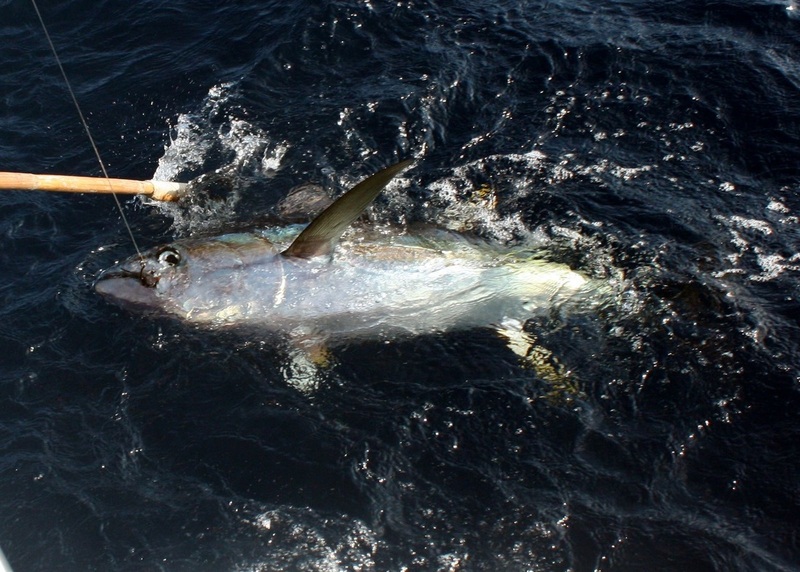 This entails cutting chunks of a large bait fish (perhaps a Skipjack) and then tossing them over the side like chum. In one of the chunks hide a circle hook and let it drift down naturally with the rest of the chunks. Make sure you let out a lot of line so that the chunk can drift without any drag. If something picks it up it will take off and you will know right away. Tuna don't nibble. Circle hooks are usually the way to go for Tuna. Since they usually grab the bait and run, it is easy to just point the rod toward the fish, engage the reel, and let the circle hook slide into the corner of the mouth. That way, you have much less chance of the fish's small teeth chafing against your leader during the fight and eventually breaking you off. Once circle hooks are latched on, it is very hard for fish to throw them. All Tuna have good eyesight so a fluorocarbon leader helps your chances of getting bit. I like the pink leaders from Yo-Zuri; they look funny but they get bit and are strong. The biggest Yellowfin Tuna are on the Pacific Coast of Mexico. 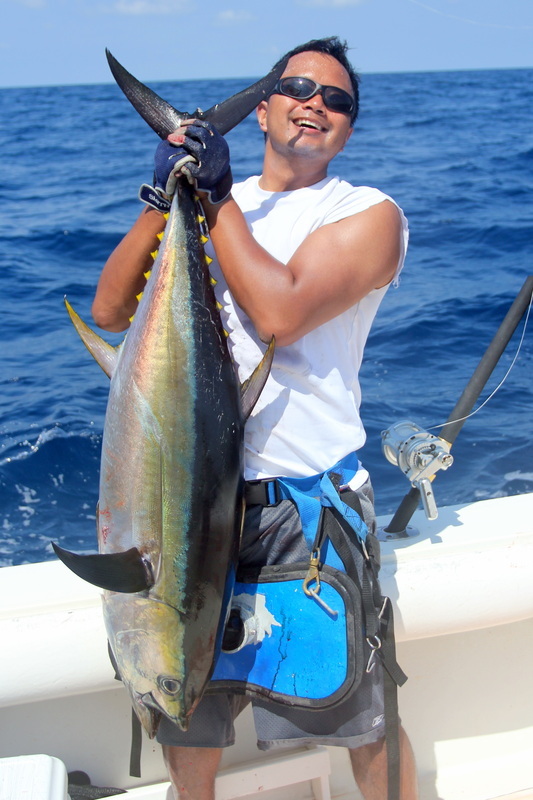 The San Diego long range fleet targets these in the fall and most of the biggest ones are caught on these boats. Puerto Vallarta also has some giants, as does Hannibal Bank in Panama. Louisiana is supposed to have a good fishery for the 100lbers if you want to be in the States. All of my big ones were caught in Puerto Vallarta though.